132 pages | 16 B/W Illus. Jumpstart! Thinking Skills and Problem Solving presents a collection of simple to use, multi-sensory games and activities which will jumpstart students’ understanding of problem solving in action. If you are one of the thousands of teachers looking for a range of practical and fun ideas to engage pupils in effective proactive learning, then this is the perfect book for you. 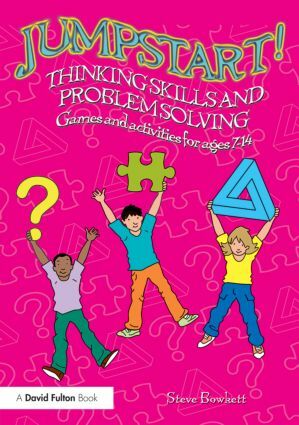 Specifically written to help teachers work within the guidelines of the new curriculum, activities in the book will help pupils to explore and learn a wide range of problem solving and independent thinking skills in an atmosphere of fun, mutual support and tolerance. Sections within the book reflect key areas of the new curriculum and offer a treasure trove of ideas for building problem solving and thinking skills into daily teaching.and provide tried and tested methods of helping children ‘learn how to learn’. Jumpstart! Thinking Skills and Problem Solving will celebrate the joy of critical and independent thinking and become a vital resource for all classroom teachers at Key Stage 2 and 3. Steve Bowkett is a former teacher and the author of numerous books for teachers including the bestselling Jumpstart! Creativity. He also works as an educational consultant specialising in the areas of thinking skills and problem solving, creativity and literacy. The　Jumpstart! books contain ‘quick-figure' ideas that could be used as warm-ups and starter exercises; as well as extended into lessons. Each book has more than 50 inspiring games and activities for Key Stage 1 or Key Stage 2 classrooms. Practical, easy-to-do, and entertaining, the ‘jumpstarts’ will appeal to busy teachers in any primary school.